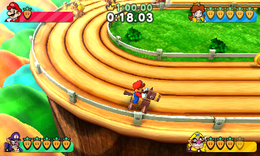 Rockin' Raceway is a 4-player minigame found in Mario Party 3. It is also included in the minigame compilation title, Mario Party: The Top 100. Players have to race with rocking horses and collect carrot cards. If the player gets an orange carrot power-up, the player can proceed rapidly without losing any energy for a moment, but if the player gets a blue carrot, that player is stunned for a moment. If a player runs out of carrot energy, their horse's speed decreases to a minimum until the carrot power regenerates. The first player that finishes half of the lap wins. The carrot meters are identical to the one seen in The Legend of Zelda: Ocarina of Time whenever Link is riding Epona. As with the rocking horses in the mini-game, Link can command Epona to travel at full speed until the meter runs out. Game Rules – "Saddle up a hobby horse and race. Use the carrot panels in the middle of the track to dash." Advice – "If you try to go too fast, your hobby horse will spin out. Slow down when your carrot meter gets low." Description – "Ride your wooden horse to the finish line. Remember to watch your horse's stamina!" On-screen – "Ride your wooden horse to the finish line!" This page was last edited on December 30, 2017, at 08:52.